This past weekend I traveled to Philadelphia for a dear friend’s Mama Blessing, which I helped plan and organize. After celebrating and uplifting the new mama, I’m returning to Vermont with a renewed passion for honoring the rite of passage into motherhood. It’s important to specifically do so in a way that makes the new mama feel held by her community. Without this acknowledgement and invitation to include the community, it’s easy for a mother to feel more overwhelmed and intimidated than necessary. I’m reminded that we truly cannot do it alone, and should never feel like we have to. One of the themes that continuously flowed throughout the celebration was “community”. The party was potluck-style and the conversations were centered around togetherness and mutual support. 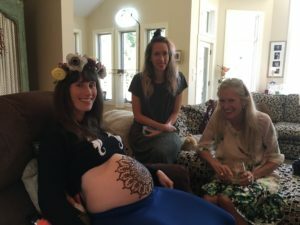 We discussed how we were all connected through our love for the mama-to-be, we organized a meal train, and made a collaborative birth playlist together. I noticed how uniting to celebrate this woman we all love made us feel connected to one another, even though many of us had not previously come together. This rite of passage and its sense of communitas is undoubtedly one of the gifts of new motherhood—it does have a way of transmuting and transcending difference. When I checked in with her after the celebration, my friend said that she felt “happy and ready”. Success! Celebrating with her, I was able to tune back into how I felt at my own Mother Blessing, which was very similar to what she described. I specifically remembered the feeling I had afterwards, which was the feeling of being ready to give birth, despite all of the ways in which we remain unprepared (and I think this is an important distinction). I am now ready and able to support other mothers in whatever ways I can to plan and execute their own Mother Blessings so that more women can go into their births feeling truly supported and strong. I’m excited to begin offering this as a service through Birth Love Family. You can reach me at birthlovefamily@gmail.com to begin planning your Mother Blessing!